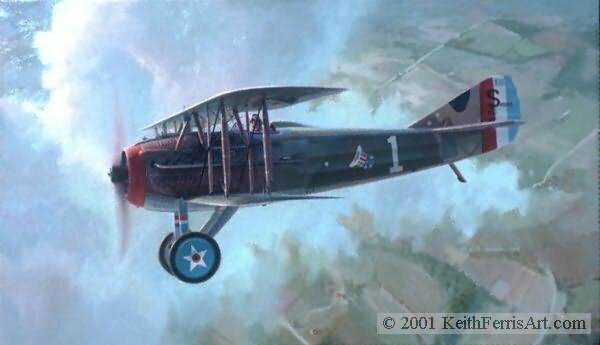 SPAD XIII World War I ace Captain Eddie Rickenbacker flying his well known SPAD. America's leading World War I ace, Captain Eddie Rickenbacker is shown flying his famous SPAD XIII Number 4523 in October 1918. The aircraft had been the first of these rugged aircraft to serve the formerly Nieuport equipped 94th Aero Squadron. The aircraft carries the squadron numeral "1" and the 94th's emblem signifying Uncle Sam throwing his "hat in the ring" on America's entry into World War I.